Take your communications to your employees wherever they are. Oplift’s communications app keeps everyone connected, engaged and up to speed with your latest news and comms. You can see the engagement of your internal comms so you can tailor your material accordingly and boost readership. Make it easy for employees to stay up to date, all news is clearly presented by category and fully searchable. If employees have any feedback or questions there is an option to contact the author. All of the latest news will show in a feed on the home screen. If employees have missed any of your news, not to worry because you can mark your comms to be included in a summary roundup which can be sent daily, weekly or monthly. For any urgent announcements you can send location targeted alerts directly to your employee’s devices, these will show up even when their device is locked. Perfect if you need to make staff aware of a new learning module which they have to complete. Eye-catching clickable banners are on the home screen for maximum awareness, perfect for events and announcements. The knowledgebase organises and clearly presents your company information, it’s all in one place and can be accessed while mobile on our simple comms app. Staff can quickly search for anything they need to know. Policies, manuals, guides, instructions and How To resources. It can be filtered by roles and locations so employees only see the information relevant to them. Feedback can be collected which doesn’t have to show to other users, this makes sure documents are accurate and understandable. 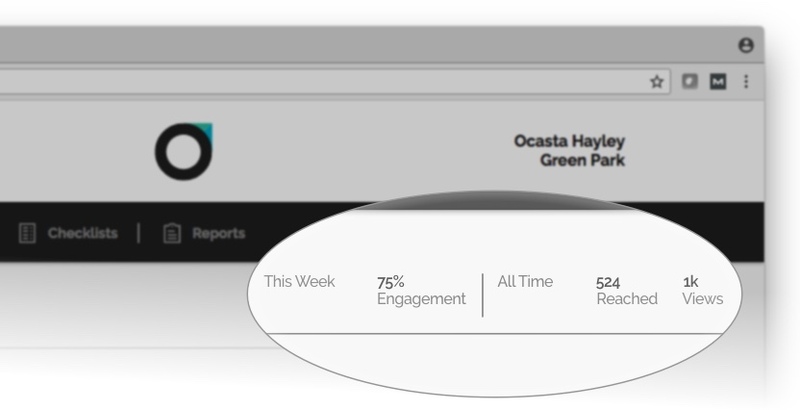 All articles and news items in Oplift’s communications app are tracked, so you can find out what’s popular, who has read what, an engagement score shows how engaging your content is, and what content to focus on. Understand your workforce and create the content your staff want to read. Make sure important articles are always read with Oplift’s Acknowledgements. Simply tick if you want an article to be acknowledged and employees will be notified. Send alerts to anyone who hasn’t acknowledged your articles yet. To help employees stay engaged with your internal comms you must let them know that you appreciate their efforts to stay up to date. Oplift’s communications software includes ‘Achievements’ which encourage feedback and recognition so you can hand out trophies and stickers for when employees stay up to date with the latest news and articles. To make sure employees keep learning, you need to make sure you are constantly reminding them of learning programmes and modules. Oplift makes it quick and easy to make employees aware, you can use banners, alerts, news and achievements. By handing out stickers and trophies in achievements you can keep employees engaged and motivated to continuously learn. Drive communication, engagement and knowledge with Oplift’s communications app, see how we can help you!